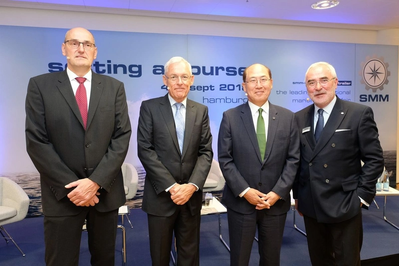 At today’s opening press conference of the international maritime trade fair in Hamburg, political and business leaders discussed current challenges facing the shipping industry. The focus of the debate was on the 0.5 percent sulphur limit for ship fuels which will take effect on January 1, 2020, and the industry's goal to cut greenhouse gas emissions from global shipping in half by the year 2050. Roughly 2,300 exhibitors and the extensive conference program accompanying the trade fair will deliver answers to the industry's complex questions. Roughly 50,000 visitors are expected to attend. SMM is open to the international industry audience from today until Friday, September 7. Bernd Aufderheide, President and CEO, Hamburg Messe und Congress GmbH, which organises SMM. In his opening address, Bernd Aufderheide emphasized the great importance of SMM as an international and interdisciplinary platform for decision-makers and experts from the maritime world to share thoughts, ideas and experiences. In challenging times such as these, he said, the industry demonstrates its determination to pull together, discuss solutions for the future, and deliver impetus for long-term political decisions. The 13 exhibition halls present a wide range of current technologies and tangible innovative solutions for greener as well as more efficient ship operations, he pointed out: "Apart from digitization, green shipping is one of the main themes at SMM 2018. Exhibitors offering ‘green’ products cannot only be found in Hall A5, which is entirely dedicated to green propulsion. The Green Route likewise includes a very large number of ‘green’ companies, and many of them present innovative products that can truly make a difference in helping shipping become more eco-friendly," said Aufderheide. The exhibition is accompanied by segment-specific conferences, such as the global maritime environmental congress (gmec), the Offshore Dialogue, or the Tradewinds Shipowners Forum, which focuses specifically on the challenges facing shipowners and is held in conjunction with SMM for the very first time this year. Shipowners must invest enormous amounts of capital to meet the stricter emission limits and the ambitious climate protection goals, from scrubbers and other filter technologies to alternative propulsion technologies which will be needed in the medium term. At the same time, more than 50,000 oceangoing ships around the world are required to install ballast water management systems, as well. Esben Poulsson, Chairman of the global shipowners organization International Chamber of Shipping (ICS), took up the issue of the ‘Sulphur Cap’, highlighting the challenges the new limit brings about for the shipping industry: "ICS fully supports the implementation of the sulphur limit and accepts that postponement is not an option." What is crucial now is careful planning, he said. "It is important to consider that shipowners must begin purchasing compliant fuels as early as the middle of next year." A recent survey by the Swiss investment bank UBS among ship managers revealed what all this means: From 2019 until 2023, more than $250 billion of equipment investments and operating costs will have to be shouldered by owners to comply with green shipping requirements. The IMO's climate protection strategy will require an even greater effort: “The goal for 2050 can only be achieved with radically new propulsion systems, such as hydrogen and batteries," said Poulsson. Engine manufacturers play a key role in making the maritime energy transition happen; and all the major players are exhibiting at SMM. Dr. Frank Starke, Global Product Manager Medium Speed Engines at the engine manufacturer Caterpillar, is well aware of the challenge. "The ambitious 2050 greenhouse gas target can only be achieved by combining several technologies, including innovative engine technology, various fuels, new fuel production methods – such as Power to X – and exhaust gas aftertreatment," the engineer predicted. Special applications will require special solutions, such as battery operation in short-sea shipping, he added. It is of paramount importance that all stakeholders act in concert, Starke stressed: "The required massive investments of creative intelligence and capital can only be justified if there is a predictable, globally harmonized emission regulation regime. Adherence to these regulations must be monitored effectively and enforced strictly to create a level playing field around the world. Bernd Aufderheide then invited the panelists and journalists to join him for a tour of the exhibition halls: “Experience an industry that utilizes all of its accumulated engineering prowess to steer shipping towards a sustainable future.” He said he was confident SMM would deliver the necessary encouragement. “I have no doubt that both, visitors and exhibitors will leave the trade fair with a sense of optimism after four information-filled days – and that they will return in 2020."